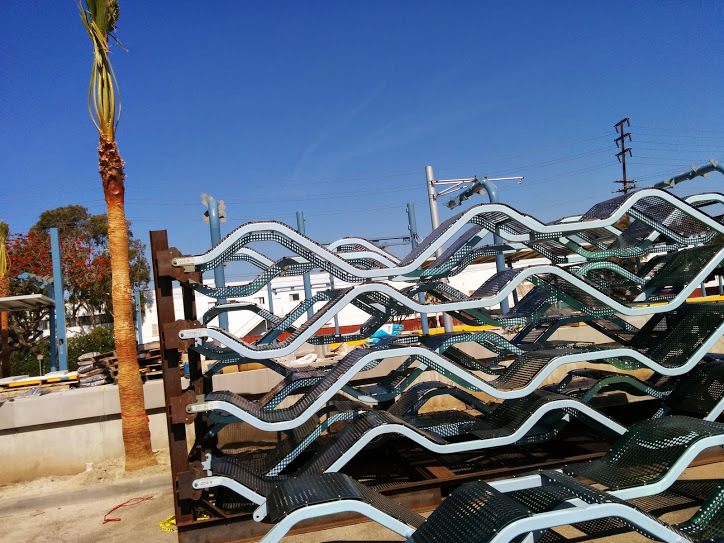 Los Angeles Streetsblog head writer Joe Linton contributed to this report. Expo Phase II completes the long-anticipated rail connection between Downtown Los Angeles and Downtown Santa Monica. Construction on Phase II began in 2011. 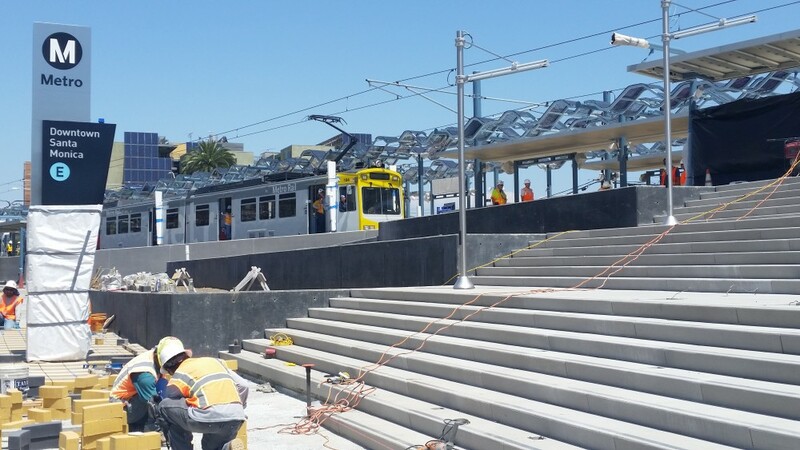 Currently, the Expo line ends in Culver City. When the new 6.6-mile extension opens next year, it will be possible to take the train from the beach to Downtown Los Angeles for the first time in half-a-century. Where: The Expo Line currently runs from 7th Street and Flower in Downtown Los Angeles. It then heads to L.A. Trade Tech College, past USC, Exposition Park, and the Coliseum. It continues past Baldwin Hills and currently terminates in Culver City. Phase II will bring the line through Palms before cutting north of the 10 Freeway. Other Phase II stops will include Westwood Boulevard, Sepulveda Boulevard, and Bundy Drive. 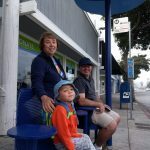 Then, it crosses into Santa Monica, stopping at 26th Street (Bergamot Station), 17th Street (Santa Monica College, UCLA Hospital), and finally, 4th Street in Downtown Santa Monica. When: Though Expo Phase II construction is nearing completion, a solid opening date remains elusive. According to Metro, as of March 19, design is 99 percent complete and mainline construction 84.6 percent complete. Metro is juggling two new light rail line extensions, Expo II and the Gold Line’s Foothill extension, both anticipated to open in early-to-mid 2016. According to this week’s Metro budget staff report, the agency will begin service on both new lines in the second quarter of Fiscal Year 2016, between April and June of 2016. 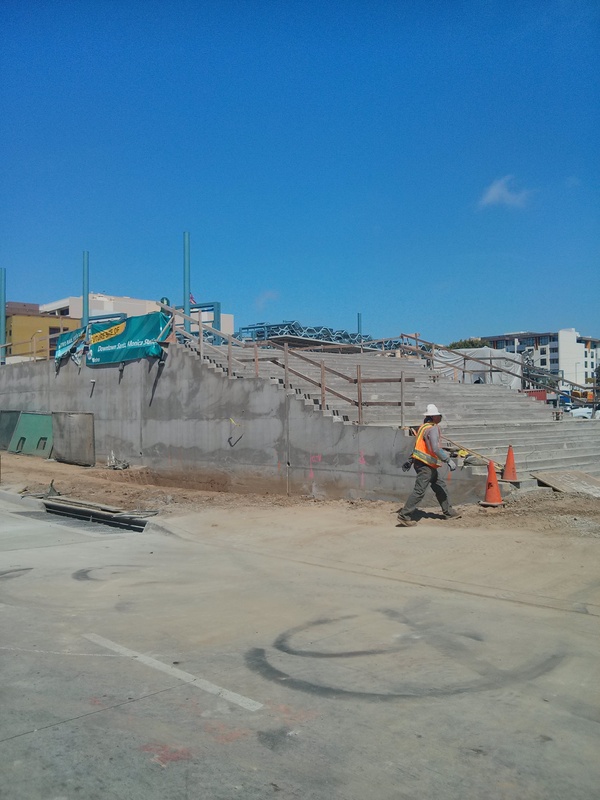 Construction at the Bergamot Station stop at 26th Street earlier this month. If you have been to any of the new stops recently, you will see that construction sure looks like it is nearly complete. 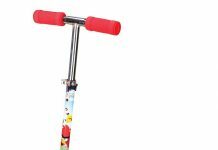 In fact, Metro anticipates that it will be able to start safety testing in April starting in Palms. Even though we may end up seeing trains running this summer, there will still be at least six months of testing after the Expo Construction Authority completes its work. Issues: The two main issues facing Expo at the moment are a delay at the maintenance facility and a potential shortage of trains, which could result in longer headways when the line first opens. 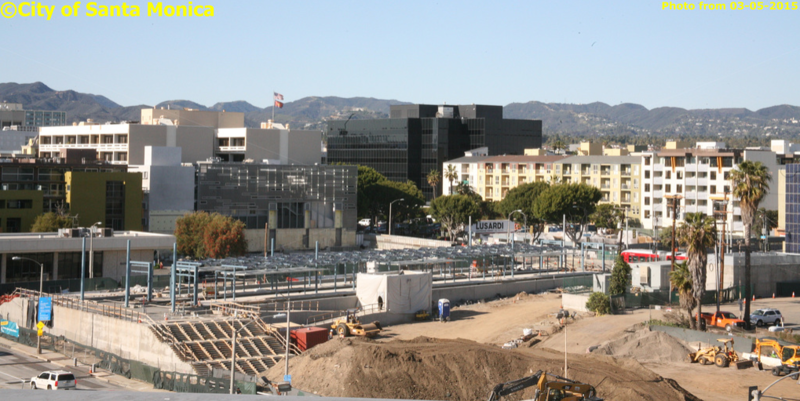 The maintenance facility, being built in the eastern edge of Santa Monica, is behind schedule, according to Metro. The “substantial completion date” for the facility has slipped from May 2015 to October 2015. According to another Metro staff report this week, the agency anticipates a “temporary shortage of light rail vehicles.” The shortage has been attributed to a labor dispute at Kinkisharyo, the company that supplies trains for Metro (Note: As noted in the comments, the shortage isn’t a result of the labor dispute, but rather Metro changing suppliers). 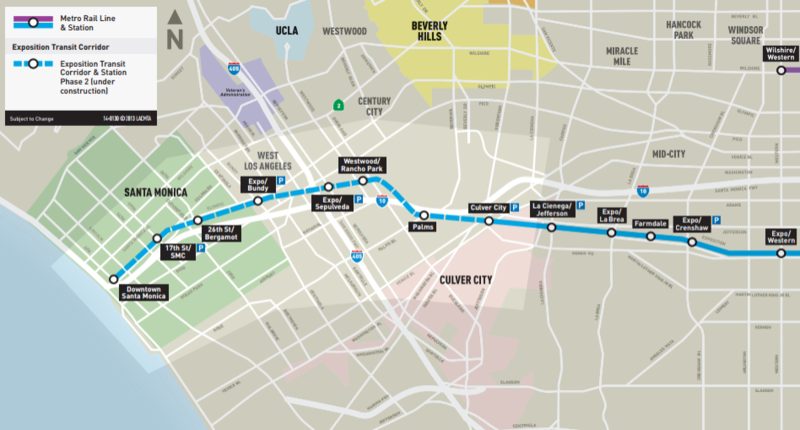 Given the shortage, Metro expects some longer-than-usual headways when Expo Phase II first opens. Metro expects to initially operate Expo will operate between Santa Monica and L.A. every 12 minutes in the morning and afternoon. A closer look at the 4th Street Station. According to Metro, as more trains become available, some day, the Expo Line will operate every six minutes in the morning and afternoon, cutting the headway in half. In some ways the new sections of the Expo Line and the Gold Line are involved in a game of chicken. If one project encounters serious delays, the other project may get the full-steam-ahead, with a possible lack of rail cars heaping additional delay on the line that lags behind. An even worse scenario could occur if Kinkisharyo hits a snag, delaying rail car delays to both lines. The poor headways shouldn’t last long, though. The six-minute wait time has been pledged to be improved to a five-minute wait time when Metro opens its Regional Connector subway, currently anticipated in 2020. When the Regional Connector opens, riders will be able to board in Santa Monica and travel all the way to East Los Angeles, without changing trains. Expo’s almost done, and that is welcome news. As the longest east-west rail line on the Westside, it is a crucial piece of Metro’s growing network. It will connect neighborhoods — including those in East L.A. once the regional connector is finished — with major job centers. But, it’s possible that it might be a slow start before ultimately reaching its full potential and assuming its vital role in the region’s expanding rail network.